Bambrick Court, Wodonga is home to a handful of dwellings, but the man after whom it was named had a much larger presence in his time in Wodonga. In 1869 James Bambrick built the Railway Hotel, in Sydney Street (now High Street), close to the intended rail terminal in Huon Street. When the rail finally arrived in 1873, the station was built near the corner of High and Elgin Street. He operated the hotel until 1902. In 1876 when Wodonga split from Yackandandah Shire, James Bambrick was one of ten nominees for the newly formed Council. Bambrick attained 115 votes, second to John Woodland with 146, and he continued as a member of the Council without a break until 1890, including three terms as President. The first meeting of the newly formed Council was held on 11 May 1876 at the Prince of Wales Hall. James Bambrick had built the hall next door to the hotel, and it was the venue for all Council meetings and housed the Secretary’s office until the Shire Hall was built. At various times in Wodonga, James Bambrick also undertook the roles of sergeant of police, clerk of courts, electoral registrar, Secretary of the Racing Club and registrar of births and deaths at Wodonga. Due to ill health James Bambrick was forced to sell the hotel in 1902 for a reported sum of £3000. 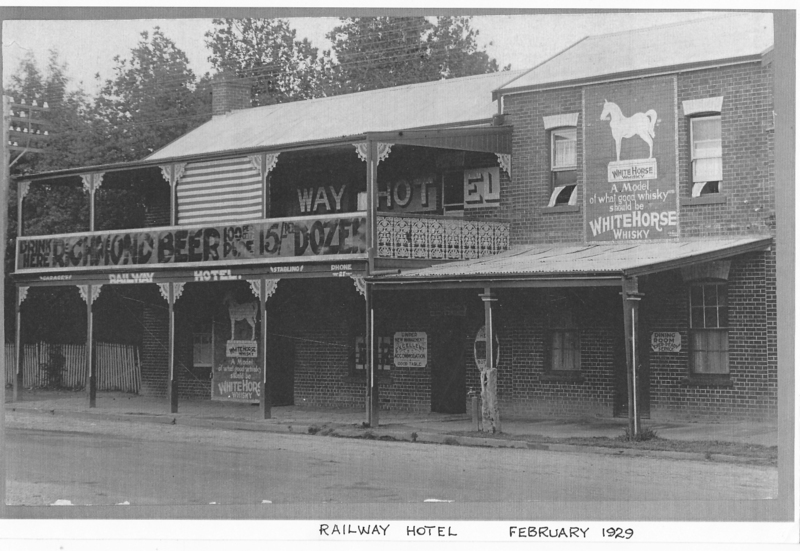 Railway Hotel 1929. In 1869 James Bamrick built the Railway Hotel, in Sydney Street (now High Street). The hotel most recently traded as O’Maille’s.